A few weeks ago I was lucky enough to get to attend a cookie exchange at Jen’s house (of Tatertots and Jello fame). There I met the adorable Amy of Ameroonie Designs. 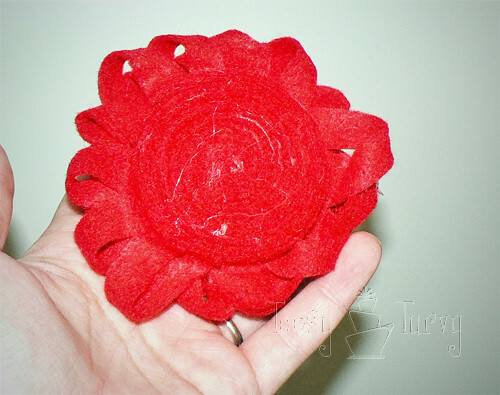 She had this AWESOME felt flower on her purse. And she has a great tutorial for it!!!! 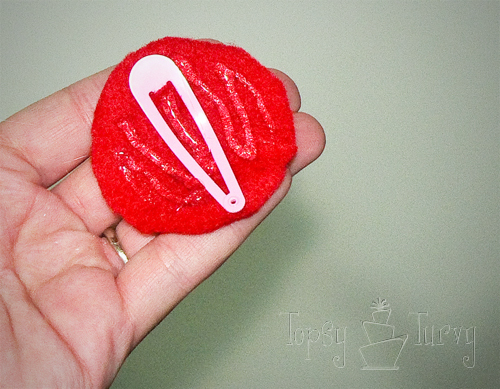 I’m not really a purse gal (but I want to be, I’m just not yet) but I AM a hair band, hair clip gal… This is so easy and so fun to make I made three different sizes. The first two are made from the same sheet of felt. 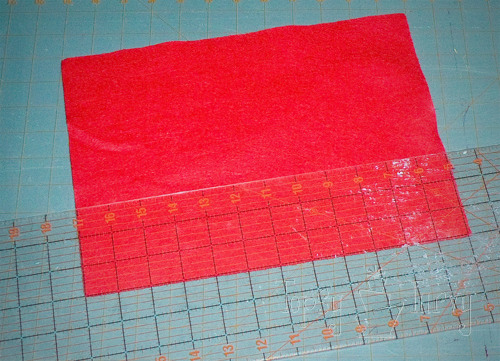 First I cut the felt page (mine is 9 inches wide) into 3 inch strips. 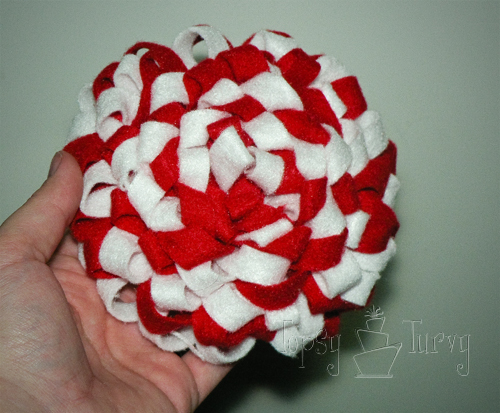 I first tried making a flower with all three strips, but it was a BIT to big for hair, and too small for a bag. 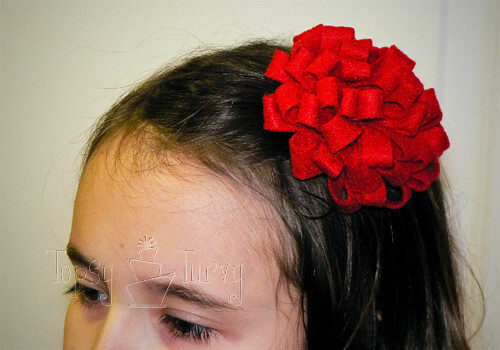 So I switched to using one strip for the small headband size pom pom flower, and the other two strips for the medium size flower. 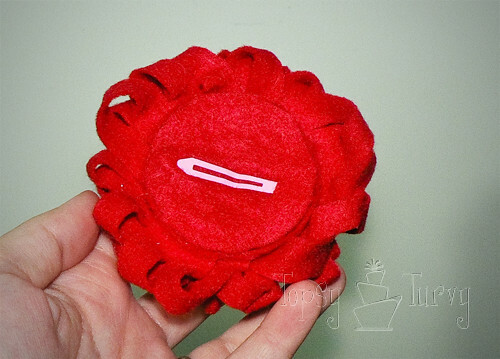 ALTHOUGH I did cut the last 3 inches off the second strip of the medium flower first and use that little square for backing both the small and medium flower. 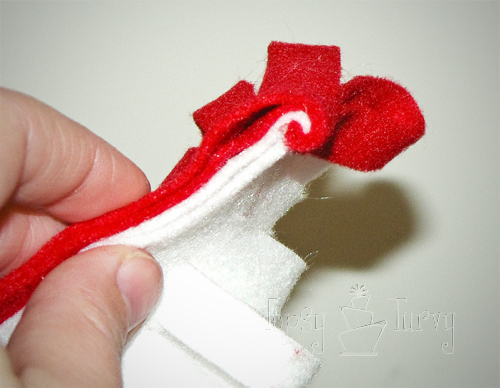 Once you cut the stips, fold them in half and cut strips every 1/2 inch from the folded side, but don’t cut all the way through. 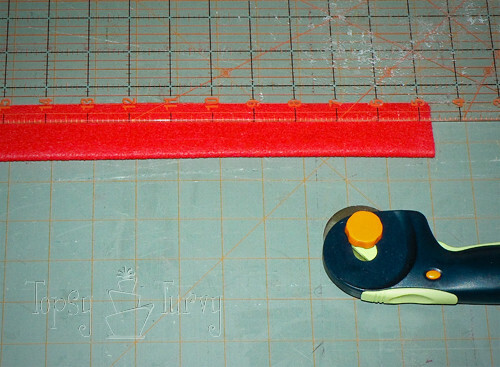 I put my plastic cutting thing over the bottom1/4 inch and then used my rotary cutter, but if you have nice sharp scissors that will be just as fast. It’s all about preference. Make it easy on YOU. See??? This is what it should look like when your done. To make it easier I tried using a hot glue to glue it closed, or you could just skip to rolling it. I tried it both ways and decided which way I liked it better. Different effects, so you might one better than another. 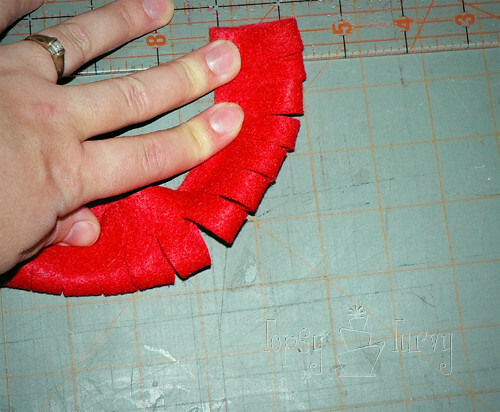 Then starting on one end start rolling… I tried rolling tight and loose. I prefer it a little loose, but try it and see what you think. 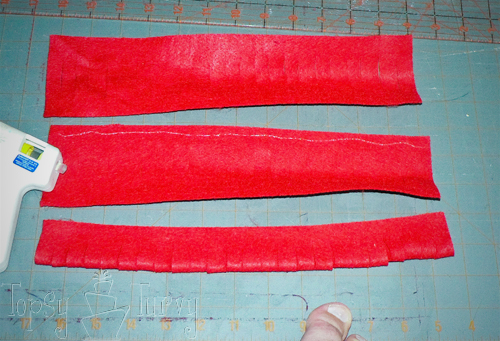 I first tried layering all the strips together and then rolling, but I found that I liked it better rolling one strip at a time. and add it to the back! there you go, medium flower! (the one above is the three strips rolled tightly. The one below is the two strips rolled loosely.) I prefer it, not so TIGHT or bunchy. 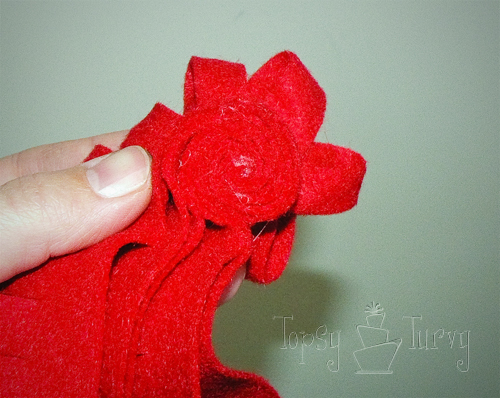 For the Larger flower I used two sheets, this time in two different colors. White and red. 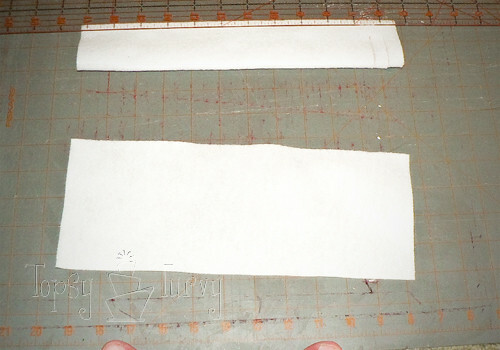 I started by cutting the sheets in half, 4.5 inches wide each. Then I did the strips every 1/2 inch, like before, but of course this time they are longer. Now I glue the two colors together and started rolling. Here is the back, you can see how pretty it is, and I love the two colors together. Of course this would also look great in one color, but I wanted something for my coat for the winter months. And the front! It’s HUGE, like the ones on Amy’s bag’s. Personally I’ve been wearing it on my coat and getting complements everywhere. If you have that perfect bag it would look great on it too, but this flower is about twice the size of my small denim purse! And too much for my zipper purse! 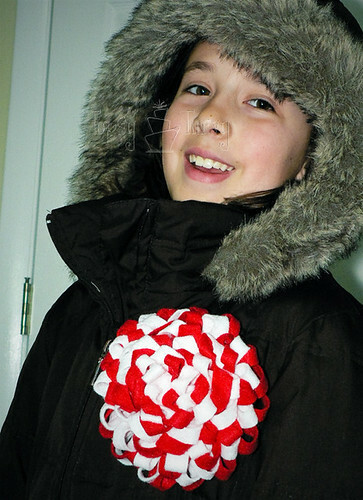 Here’s computer girl modeling it on her coat. It’s just too hard to take pictures of myself, and I never have anyone around to take pictures of me! So I know it’s way too big for her coat, but it looks great on mine (at least I think so) Also… My camera died, died died died! So now I’m stuck sharing tutorials of things I already have pictures of, and I CAN’T replace it any time soon. They turned out so great Ashley! I love the looser one too, it’s such a fun look! Thanks for the shout-out! I get compliments everywhere. 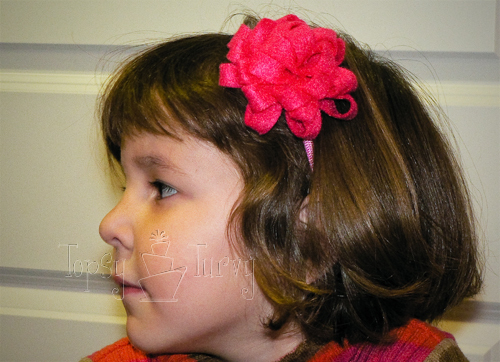 Esp on the smaller hair band for my girls. How would you feel about me selling them on my store? I love how your flowers turned out! Very cute. Sorry about your camera! 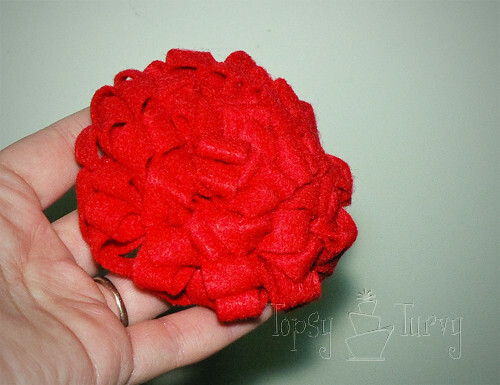 I love these flowers & will be making them soon! Thanks for sharing and for such great step-by-step pictures! I always worry when I to a tutorial it won’t be clear enough. So I’m so grateful for comments letting me know I did an okay job! Good luck! This is so cute! Thanks for sharing! !